Tired of stabbing yourself in the hand with a punchdown tool? Standard keystone jacks are cumbersome to terminate, and if you’re not careful, then a misaligned punchdown tool can cause personal injury or damage to property, such as walls or furniture. Even if the punchdown tool is used properly, prepping the cable and wiring up the keystone for punchdown on each individual conductor can take a long time. You also run the risk of losing your punchdown tool on a job, making it nearly impossible to continue punching down on standard keystone jacks. Enter the Keystone Cat6A Jack. The Keystone Cat6A Jack is a reusable, tool-less keystone jack with a color-coded T568A/B wiring guide block to hold conductors in place for termination. This makes it easy to terminate and cheaper to use, since no punch down tool is required to terminate the jack. Since the jack is reusable, any wiring mistakes can be easily fixed without wasting a keystone jack, and inviting additional possibility of injury from a punchdown tool. 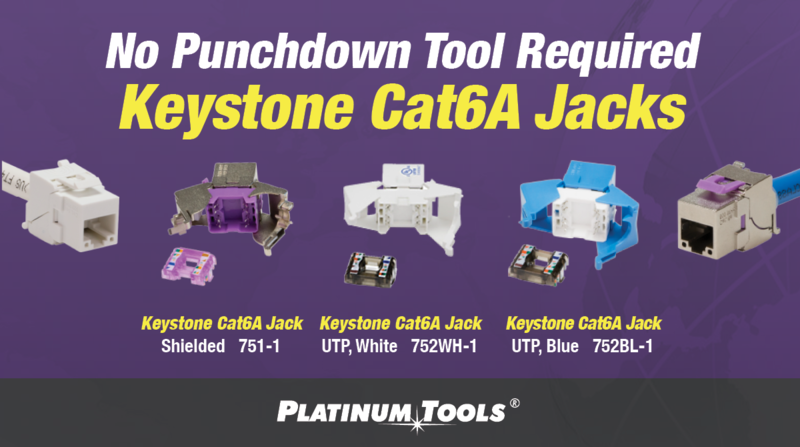 Designed to fit industry standard wall jacks and unloaded patch panels, the Keystone Cat6A Jack can easily replace any worn out or outdated keystone jacks and it can integrate into newer wiring projects with little difficulty. With the ease of use and its reusability, this makes the Keystone Cat6A Jack a great fit for both DIY-ers and professional cable installers. Cable installers will also appreciate the wide range of cables that can be used with this jack, as it works with solid or stranded conductors from 24 to 22 AWG. The Keystone Cat6A Jack has 50µ gold contacts and meets Cat6A channel shielded and unshielded performance up to 100 meters. The jack also exceeds TIA/ EIA-568-C.2 standards and is RoHS compliant and UL listed.